Helping a college student learn to budget and save will be a benefit throughout life. Question: My son is starting college this year. I want to sit him down to help him learn how to set a budget, but he is resisting. How much should I press him? Answer: No matter what your son is majoring in or how much he ends up earning during his career, learning how to set and live on a budget is one of those critical life lessons that will impact him for years — really, decades — to come. If he doesn’t learn how to manage his money now, he very well may regret it later when he has to deal with the consequences. If you’re going to insist on anything, insist he at least sit down with you to talk about it. It’s not unusual for a young person to stonewall when a parent wants to offer guidance. He is probably feeling like he is on the brink of independence and doesn’t want to acknowledge that he still needs a parent’s helping hand every once in a while. But this is important, and worth putting up with some teenage sullenness. The National Endowment for Financial Education is a nonprofit organization designed to help young people and adults learn about financial decision-making. It offers whole curriculums for high schools and colleges to offer personal finance programs. Its resources are free, and you can download them yourself without taking a whole course. One resource you may find helpful is “40 Money Management Tips Every College Student Should Know,” available at www.smartaboutmoney.org/Portals/0/ResourceCenter/40MoneyManagementTips.pdf. You can share this 32-page guide with your son to review on his own, if he’d prefer, before you sit down with him to go over some basics. It includes a spending plan worksheet to help your son list sources of income and anticipated expenses — a great starting point for budget planning. Bankrate.com, an industry leader in offering personal finance information on the Internet, offers an online student budget calculator at www.bankrate.com/calculators/smart-spending/college-student-budget-calculator.aspx. It’s designed especially for full-time college students, with the ability to plan for income and expenses monthly, per semester, or per academic year. The U.S. Department of Education’s office of Federal Student Aid offers a step-by-step guide for college students to learn how to keep track of income and expenses, save toward specific goals, and adjust a budget when circumstances change. It’s online at studentaid.ed.gov/sa/prepare-for-college/budgeting/creating-your-budget. If he doesn’t already do so regularly, put a special emphasis on both building up savings and balancing a checkbook. 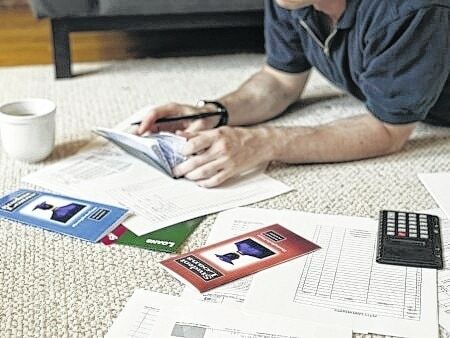 Now is the time to start a habit of regular and consistent saving, even small amounts. And bounced check fees can add up very quickly and damage your son’s credit rating. For a simple guide to balancing a checkbook, see tips from the College Board at www.collegeboard.com/prod_downloads/highered/res/cc_tips/Balancing05.pdf. Any one of these resources will be helpful for you to start this conversation with your son. Don’t shy away from this issue. It may take awhile, but eventually your son will be grateful. https://www.urbanacitizen.com/wp-content/uploads/sites/36/2015/07/web1_FF_07_2015_76754636.jpgHelping a college student learn to budget and save will be a benefit throughout life. Family Fundamentals is a monthly column on family issues. It is a service of the College of Food, Agricultural, and Environmental Sciences and its outreach and research arms, Ohio State University Extension and the Ohio Agricultural Research and Development Center. Send questions to Family Fundamentals, c/o Martha Filipic, 2021 Coffey Road, Columbus, OH 43210-1044, or filipic.3@osu.edu.